This is a very good microphone. It is extremely popular and there are good reasons for it. Here I will list all the positive attributes which I would like to know about it. It is directional, so will pick up volume when you point it in a particular direction. If you are recording on a DSLR, you might need to buy a separate Sound Recorder or install some firmware like “Magic Lantern” on your Camera. I say this because initially I did not rate the quality of the RØDE VideoPro Mic. There were issues with the quality of the sound which I recorded. I realised after some time, that it was the quality of the Canon 550d that was the problem. 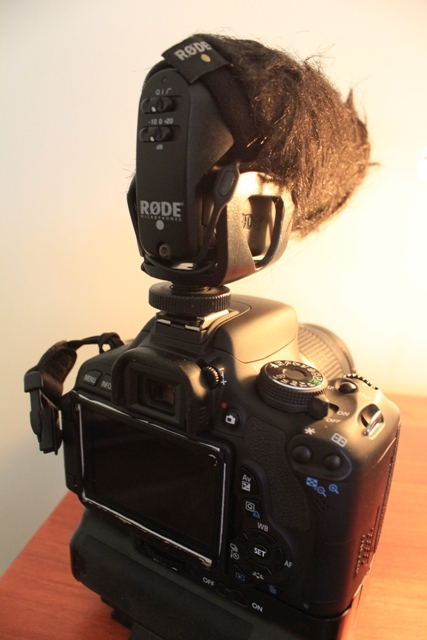 Recording onto a separate sound recorder (or directly onto Soundbooth on a laptop), meant I could take advantage of the excellent quality in the RØDE VideoMic Pro. Separate to this, I also installed Magic Lantern onto my Canon Camera. This firmware does void your Canon warranty. But, there are thousands of experts who use it and I find it to be completely reliable and invaluable when using a Canon to shoot video. The Magic Lantern Firmware essentially uses a different microphone to record sound, while also allowing you to see the levels on your screen when recording. This is something the standard Canon firmware doesn’t have and in my opinion is essential to good quality sound recording. As an amateur with aspirations of a professional recording, I need this microphone to bring me to that next level of quality. There are many generic type microphones out there, but the RØDE VideoPro Mic gives you a quality of recording which is hard to match for the price. It is durable, dependable and great battery life. I guarantee you will not be wondering why you bought it. All that comes next, is bring the rest of your gear up to the same level of quality. New travel accessories: what lasted 5 months?